ROSS Companies’ exclusive focus on the Mid-Atlantic region delivers insight on nuances of the region’s various submarkets, as well as the complexities of operating in multiple jurisdictions, which gives the organization a distinct advantage against the competition. Using a day-to-day, hands-on approach in dealing with critical components of multifamily management, acquisition, development and renovation, ROSS Companies has the experience and expertise to excel in management of any asset class, including “A” class high-rise, new lease-ups, suburban garden and distressed communities. Founded in 1983, ROSS Companies was the vision of Scott and Beth Ross, with a commitment to becoming the premier owner, operator and renovator of multifamily assets in the Mid-Atlantic region. Today, ROSS Companies is widely respected as a local authority and continues to grow by attracting the highest level of multifamily professionals with local knowledge and experience, administering multifamily real estate services and partnering with some of the world’s most prestigious equity and investment firms. ROSS Companies’ most valuable asset is our team members. Through their efforts, we acquire, develop, re-invent and manage multifamily communities in the Mid-Atlantic region, which creates a quality living experience for our residents and value for our clients. ROSS Companies is comprised of successful and experienced multifamily professionals who cultivate leadership in each team member. ROSS Companies believes that our customers are paramount in everything we do and all decisions are made with consideration of their needs. ROSS Companies applies 100% of its energy to exceed our clients’ expectations and excel in every aspect of the multifamily real estate business. ROSS Companies knows that more is accomplished when everyone works together for a common goal. ROSS Companies takes great care to ensure the decisions made are responsible ones and are made for the right reasons. ROSS Companies strives to create a vision for the future and to maintain an environment fostering creative solutions to complex challenges for all its team members. ROSS Development & Investment (RDI) has a successful track record of identifying assets to underwrite, acquire, reposition, asset manage, convert and develop into multifamily and mixed-use communities in the Mid-Atlantic region. 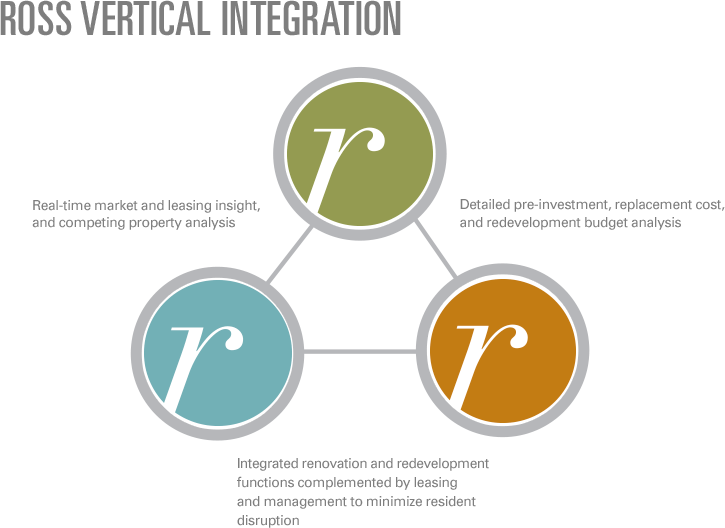 RDI seeks to produce cash returns through active management of multifamily assets, by maximizing net effective rent income, controlling costs and performing high-return capital improvements, in order to generate superior risk-adjusted returns. RDI expects to deliver above-market residual values by timing exits with optimal operating performance and opportunistic market conditions. Our years of local experience provide us with a significant competitive advantage over other multifamily operating companies.